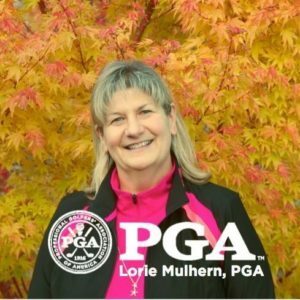 About Me – Lorie Mulhern, PGA / Golf. Nutrition. Performance. Lorie has been in the golf business since 1991, starting her golf career at High Cedars Golf & Country Club. Lorie enjoyed learning how to play and really enjoyed working in the Proshop. She soon became the Proshop Manager and was in charge of tournament operations. Lorie also loved working with student with their games. Turned Pro in 1 Year! Lorie is one of the most highly sought after Teaching Professionals in the Puget Sound area having taught thousands of students before joining the staff at Druids Glen Golf Course. She teaches all skill levels and really enjoys helping golfers improve their games, both physically and mentally. A Woman in the PGA! Lorie is honored and proud of being a woman in the PGA of America! Lorie has taught thousands of students and loves seeing them get excited about hitting the ball well. Lorie teaches with a V1 Analysis System and has been certified in the Colbert-Ballard Golf School.